Monumental standing figure I, arms raised is a large-scale bronze sculpture by French contemporary artist Pierre Yermia. Available in limited edition of 8 + 4 artist’s proofs, signed and numbered. This work is suitable for outdoor installation. It has been shown widely in sculpture parks and open air sculpture exhibitions. For the artist: "My standing figures are firmly rooted to the ground and rise vigorously towards the light like a tree, like a cathedral. 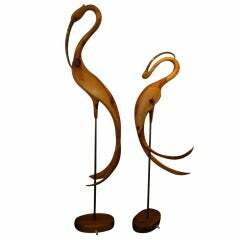 Their really slender proportions and the conversation between positive and negative give them a monumental touch, grace and vitality. ".